Julian Noga was raised in the town of Skrzynka, Poland by his mother on her four-acre farm while his father was in the United States. When Julian was 16 years, he left home and moved to Tarnow. In downtown Tarnow, he worked as a dishwasher at an elegant Jewish club. When the Germans invaded Poland in September of 1939, Julian returned to his home town of Skrynka. He returned home to find that 27 of Skrzynka’s Jews were forced to dig their own graves and then shot. He hid a rifle in some nearby woods but was unable to use it before he was deported to Austria to do farm labor for a rich landowner near Linz. Near Linz, he fell in love with Frieda, the land owner’s daughter. She loved him too. Her father objected, but the two continued to meet at night in secret. Nazi law forbade romance between Poles and Germans and the Gestapo warned Julian that if he ever saw Frieda again he would be hanged. He was assigned to another farm but continued to see Frieda. He was arrested and transferred to Flossenbürg. In Flossenbürg, Julian was sentenced to do backbreaking labor in a quarry. Julian was liberated on April 23, 1945 and after the war he reunited with his love Frieda. You can remember Julian and share more of his stories on his Footnote page. My husband’s father was a prisoner of war of the Germans – working in a labor camp. He snuck away to visit a girl he had seen through the wire – but was caught. 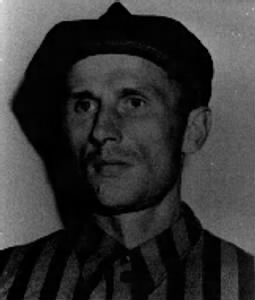 He was sent to a concentration camp (for his reckless ardor) – but was miraculously retrieved. He never saw the girl again but he survived the war.